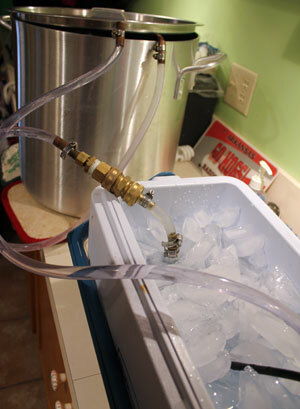 A pond pump and some ice water can really help speed wort chilling. When I noticed the thermometer in my basement read 50˚F (10˚C), one thought popped into my head: Lager Time. Finding (or creating) a space to ferment beers at lager temperatures is a challenge. Bringing wort down to lager pitching temperature quickly and easily can be a bigger challenge. I’ve found a way to deal with that challenge in a fairly inexpensive and low-tech way. My immersion chiller does a good job of knocking most of the initial heat out of near-boiling wort. But, at a certain time, the temperature reaches a plateau where the chilling slows down. The level of that plateau varies, depending on the season and the temperature of the ground water.